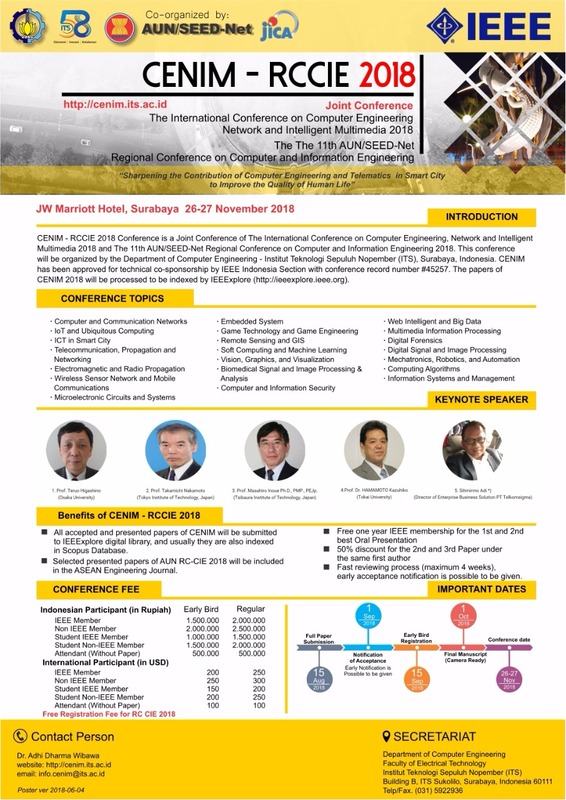 Department of Computer Engineering, ITS, will have an International Conference called CENIM (International Conference on Computer Engineering, Network, and Intelligent Multimedia) which is technically co-sponsored by IEEE. This conference will be held jointly with RCCIE of AUN/SEED.Net (11th AUN/SEED Regional Conference on Computer and Information Engineering) in J.W. Marriot Hotel, Surabaya, East Java, Indonesia. It is our great honored to welcome you to join this conference and visiting Surabaya City. If you have any inquiries regarding this joint conference, please don’t hesitate to contact us.